The 112 Pterix Mahis (Combat Wing) is based in Elefsis, few kilometers from Athens, and it is the most large and complex Wing in the Polemiki Aeroporia (Hellenic Air Force) and it is composed by several squadrons:352 Cosmos with Gulfstream V and ERJ 135LR, 353 Triena with P 3B, 354 Pegasus with C 27J, 355 Ifestos with CL215 and CL 415, 356 Iraklis with C130B/H, 358 Feathon with A 109E, AB 205A and Bell 212, 380 Uranos with EMB 145H, 384 Puma with AS 332. The institutional roles of the Wing includes all the specialities of air transport, such as transporting of military vehicles, airborne troups, tactical transport and medical emergency transport (Medevac), including the transport of human organs for transplant, and supporting of civilian people in case of calamities such as earthquake, floods, needs of civilian evacuation, air firefighting and such as all the other fighter squadrons of the Polemiki Aeroporia, all the Groups of the 112PM are always ready to take off quickly in case of emergency. 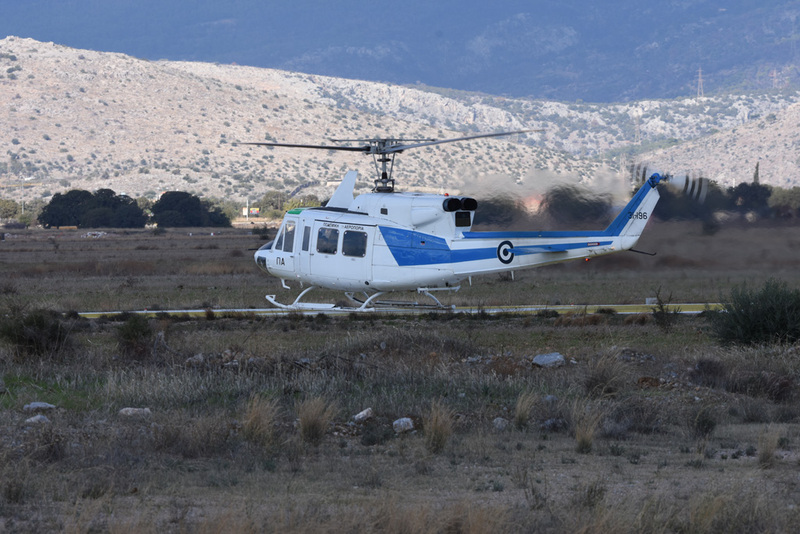 Nowadays probably the most important contribuitions of Hellenic Air Force in pubblic service are rappresented by the transport of patients at any time from any part of Greece, in particular from the islands. In such missions, the planes and the helicopters of HAF are ready 24Hours/365 days a year, and are called to transport from remote or hard to reach locations, patients or injured persons that need direct medical attention. The flights of C 130 and C 27J planes, and also of the Super Puma and A-109 helicopters from the Emergency Help Helicopter Squadron (SEAB) are coordinated in collaboration with the National Centre Help (EKAB) and the Ministry of Health. During these missions, medical personnel are also on board. During 2016, the HAF executed 1.007 missions with a total of 2.192 hours of flight, transporting 1.342 patients in need of medical assistence from various parts of Greece, while in 2015, 966 missions are executed with a total of 2.264 hours of flight, transporting 1.365 patiens in need of medical assistance. Above all this, the Wing perform SAR (Search and Resque), supporting of special operations, electronic warfare and VIP transport. 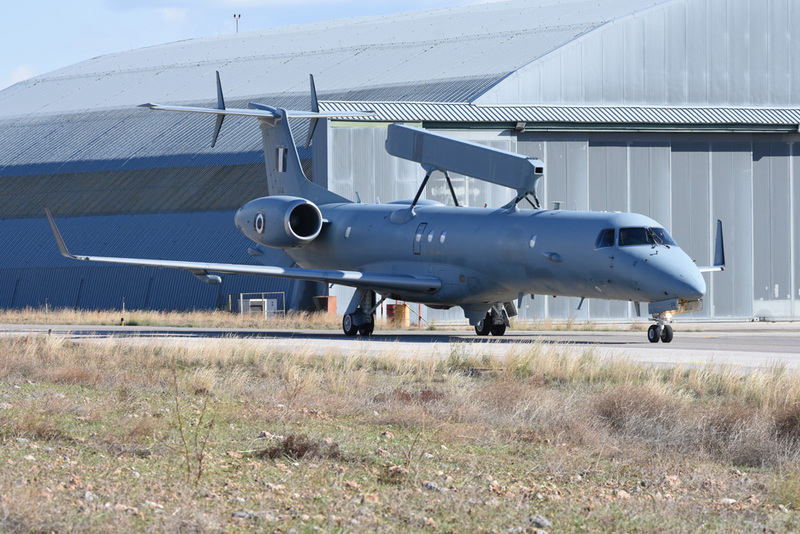 The NATO, related to the recent refugees and migrants crisis, required the employment of Hellenic Air Force in the role of ISR over the Aegean Sea, and the 112PM is providing an AEW aircraft and a Super Puma. The support of 112PM is fundamental even for the detachment of Hellenic Air Force jets in international exercises, such as the recent Joint Star Vega 2017, which took place in South Italy in October 2017, where a C 130 from 356 Mira and a C 27J from 354 Mira flown to Decimomannu air base, Sardinia, to support the four F 4E AUP Phantom of 339 Mira. A part of the training of the pilots assigned to C130 and C 27 is carried out in the ITC (International Training Center) in Pisa air base, in Italy. Here the pilots can use the flight simulator. Polemiki Aeroporia is a member of the SUG (Spartan User Group), with the aim of sharing flight experiences and to pursue the continue upgrade of the C 27 and it is composed by nine users Country (Greece, Italy, Lithuania, Bulgaria, Romania, Morocco, Australia, USA, Perù) with periodical meeting in Pisa. The 356 Mira is equipped with C 130B and C 130H. Hercules (Heracles), according to the classical mythology, was the strongest of al the deities. It has proved a fitting name for Lockheed’s C 130. Born out of an early 1950s need for an aircraft that could carry heavy equipment, artillery, tanks and troopsor air-drop paratroops, while being versatile enough to operate from rough strips, the Hercules was designed with clear goals in mind. Today the C 130 is one of the most widely-used and versatile aircraft ever produced and would stand tall in any military aviation hall of fame. It has been involved in combat right from the start and has distinguished itself not just in replenishing the front line with troops and equipment, but in turning its hand to a variety of demanding roles, from high level covert troop insertion to low level combat rescue over hostile territory. The H version entered in service in 1965, and it remained in production until 1996. Its long life gave rise to several upgrades and enhancements, leading to H1, H2 and H3 sub-model types. The C 130H is powered by four Rolls-Royce (Allison) T56 turboprops. The primary mission of C 130 is to move personnel or equipment from point A to point B. However, it is not always possible to land in the location to which the cargo or personnel needs to be delivered. 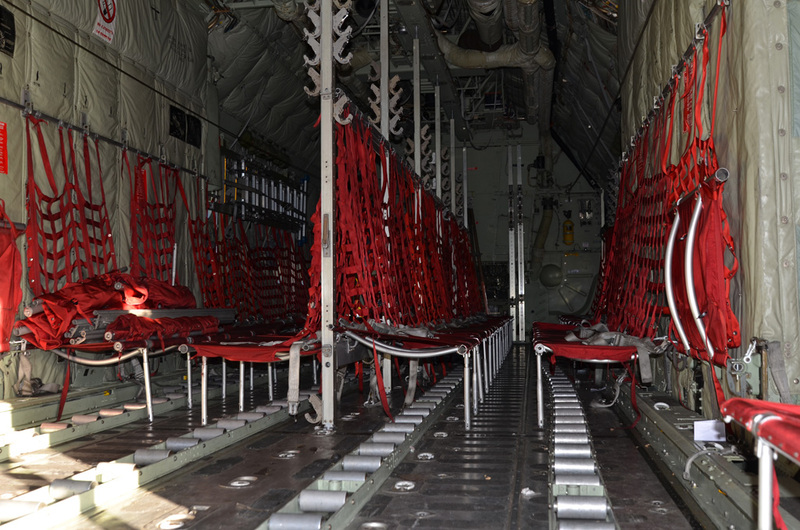 For this reason the floor in the cargo compartment is equipped with rollers, which means the cargo can be dropped out the rear door of the Hercules by parachute. The cargo is dropped inside containers which can weigh up to one tonne each. Because of the stretched cargo compartment, a total of 24 one-tonne containers can be carried at any one mission. When dropping cargo by parachute, the necessary information, such as coordinates for the drop zone, the direction, height and speed the aircraft will be travelling and so on, is entered into the flight computer which then calculates exactely when the cargo needs to be released. This means the pilot has only to concentrate on flying the aircraft within the correct parameters. The squadron does still practice visual, manual drops of equipment, in case of equipment failure. When personnel leave the Hercules by parachute, it is usually done using a static line jump, where the soldiers line up in two rows and jump out of the two side doors in such the same fashion as during second world war. However when special forces jump out from C 130, they usually exit from the rear ramp. This means they can jump in a tighter group, and since they usually carry more equipment than a normal paratrooper, it is more practical for them to leave via rear door. 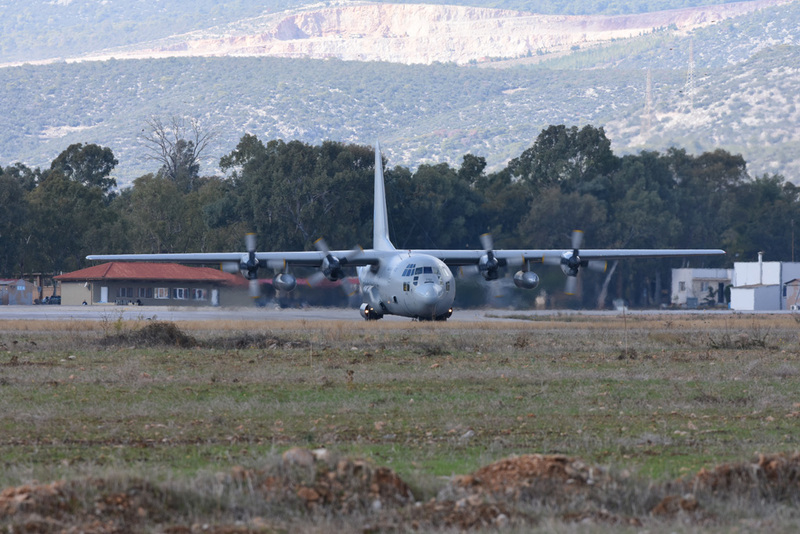 The first Greek C 130H, serial number 741, landed in Elefsis on 29 September 1975. The 356 TAS, which has previuosly flown with the C 47 Dakota, was rebuilt on 1st september 1975 to host the C 130H. The total fleet was composed by 13 C 130H and 5 C 130B. Two Hercules had ben lost for accidents, in 1991 the S/N 748 and in 1997 the S/N 750. During 40 years of activity, the 356 Mira has flown to 67 Countries in Europe, America, Asia and Africa. In 2005 had been developed an Avionics Upgrade Program. The first C 130H had been upgraded at L-3 SPAR’s facilities in Edmonton, Canada. With the delivery of the second aircraft, L-3 SPAR has completed the requred training of HAI (Hellenic Aerospace Industry) technicians. The first C 130B had been delivered to the HAF in 2006, and the 12 remaining aircraft, eight H models and four B models, had been modified for the AUP by HAI in Greece. The AUP includes a new weather radar, FMS, EGPWS, TCAS, improved autopilot, self-protection countermeasures. This program is an excellent example of how the Herc 2020 solution, an end-to-end life extension solution for the C 130, can address the complex needs of operators worlwide. Herc 2020 can extend the service life of the C 130 by 15 to 20 years at an affordable and competitive price. The partecipation of HAI in the C 130 program from the development phase is a major contributor to the upgrade . HAI is the largest state-owned defense and aerospace industry in Greece, estabilished in 1975. Its main activities are in manufacturing and support of military and civil aircraft, engines and avionics, in defense electronics, optoelectronics and missile weapon systems, and in satellite communications networks. 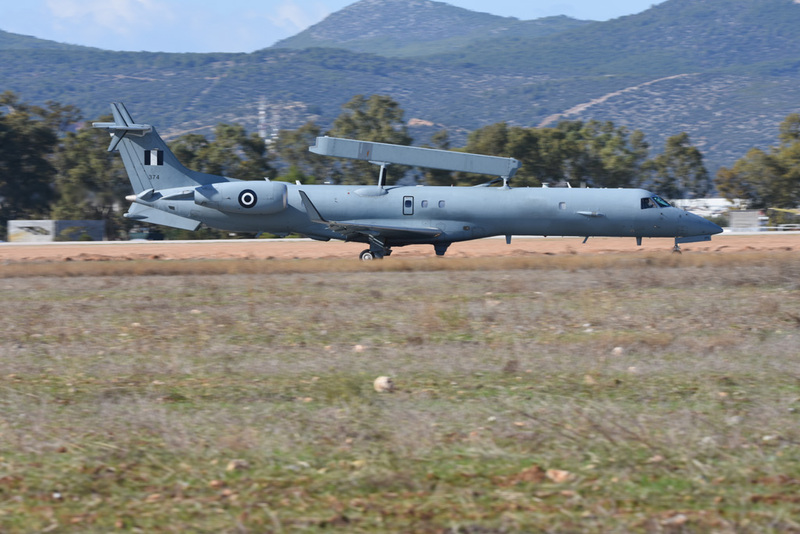 With the dawn of 21st Century the Hellenic Air Force began to be increasingly involved in international operations outside Greek borders, and the requirement for tactical air transport grew. As the Polemiki Aeroporia have become more involved in international missions, the Squadron has been very busy flying personnel and equipment all over the world in support. This has resulted in many missions to and from Afghanistan. On January 15, 2002, the Hellenic Governmental Council on Foreign Affairs and National Defense (KYSEA), with its decision no.3/2002, approved the deployment of the Hellenic Forces in Afghanistan, specifically in the Kabul area and its environs, in compliance with the Bonn Agreement, dated 5 December 2001 and based on the UN Security Council Resolution no.1510 (non-deployment of the Hellenic troops outside the city of Kabul constitutes a national restriction). Starting on 19th February 2002, two C-130s in airlift/ transport role flown to Karachi, Pakistan. The mission of the Hellenic Force in Afghanistan was: To assist the efforts of the Afghan Government to reconstruct the country, offering humanitarian aid, constructions and public services support, to enhance the level of cooperation between the Hellenic Armed Forces and the Forces of the other countries participating in ISAF, to participate, once again, in the implementation of the UN Security Council resolutions. 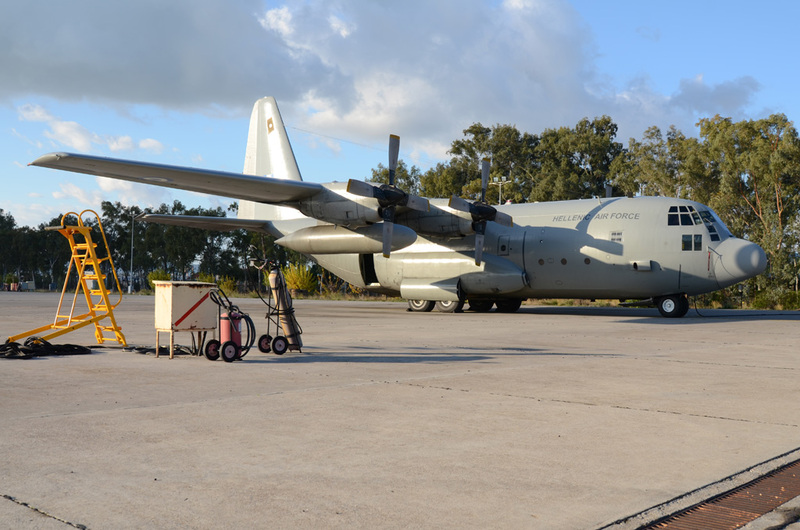 The Hellenic Air Force with C-130s has transported to and from the United Arab Emirates personnel and material, to be forwarded to Kabul. NATO has been leading a peace support operation in Kosovo (KFOR) since 1999, and since that time the effort of Hellenic Armed Forces is still active with the presence of its Brigade and Contingent supported by the C 130s of 356 Mira which flies twice a month on the rout Elefsis-Naples-Sarajevo-Pristine. When necessary, the Hercules are still involved in the mission to support the operation in the Former Yugoslavian Republic of Macedonia, such as in Bosnia-Herzegovina. All the operation of 112 Mira outside Greek borders took place under the umbrella of NATO. Ancient Greeks tried to conquer the skies with their winged creations more then 3.500 years ago. Pegasus was the wonderful white bangtail haltered by Velerefontes, the grandson of Sisifus. Pegasus was the first means of air transport which Jupiter used for transferring his thunders from Ifesto’s workshop in the Aegean island of Limnos to Olympus. The 354 Squadron was estabilished on May 16, 1970 and was equipped with N 2501D Noratlas and C 47 Dacota. The highlight of the squadron’s action was undoubtely the heroic mission on the night of 21st to 22nd of July 1974 in Cyprus, which later was characterized as a suicide mission. 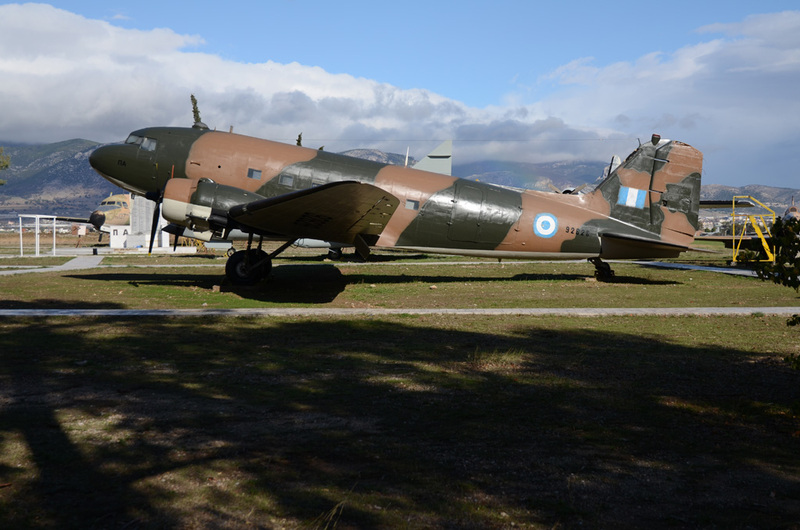 The operation had the code name “NIKI” and provided for the Airlift of the 1st Commando Squadron with the use of all aerial transport forces of the Hellenic air force. The mission was intended to be accomplished from Suda air base and the destination was the Cypriot Nicosia airport. On the crucial night 15 Noratlas took off with the aim to delivery anti-tank equipment to the defending forces who were operating there. Receiving anti-aircraft gunfire from the ground, Noratlas aircraft performed their mission but not without casualties. 11 aircraft managed to get back to Suda. The LMATTS C 27J Spartan is the new medium capacity transport aircraft for the HAF manufactured by the joint venture between italian Alenia Aeronautica and US Lockheed Martin. This wonderful aircraft was born when Alenia, that had already gained experience from the medium capacity transport aircraft of G 222 back in the ’70s and ’80s, joined forces with Lockheed Martin as part of the Italian Air Force C 130J offsets program. It has been that successful the design of the G 222 that it has been vastly adopted by the C 27J program. The most profound difference from G 222 is the six-bladed Dowty propellers for the two Rolls.Royce AE 2100d2 powerful turbo-prop engines. 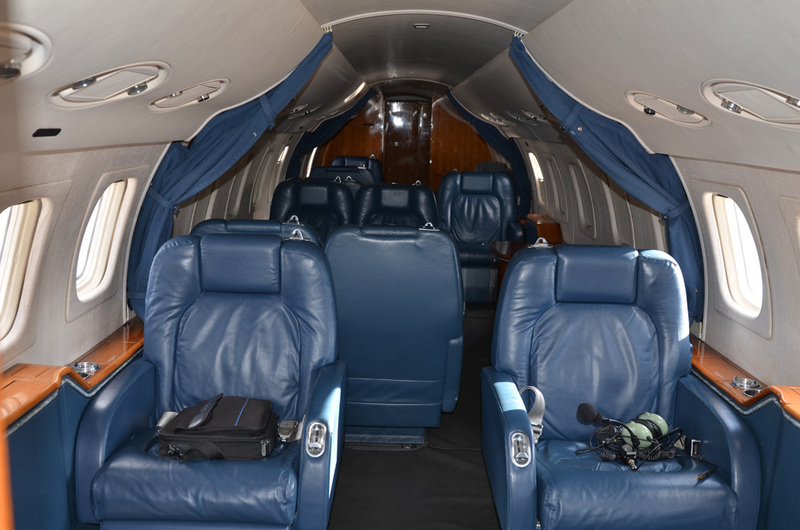 It is the interior of the aircraft and its system’s integration thart make a complete difference on the inside. Apart from the powerful engines, the Spartan features a state of-the-art electonics/avionics technology. 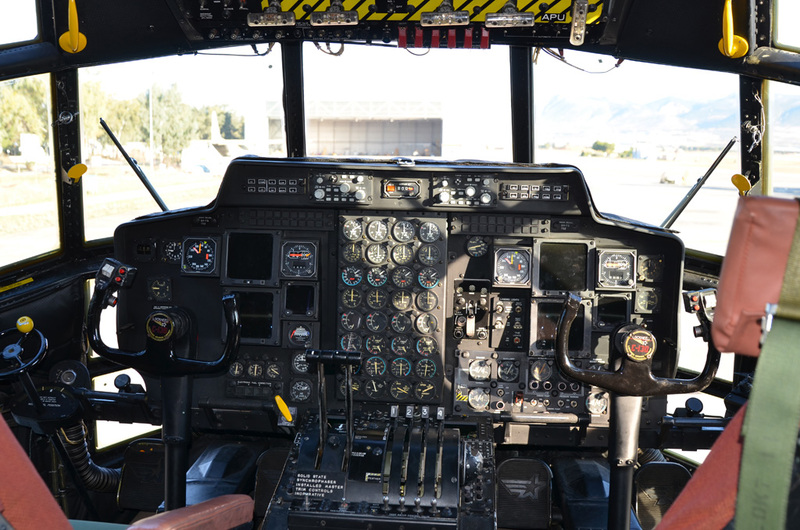 The cockpit is fully digital but the aircraft’s real strong point stems from the wise utilization of the cargo compartment, where a series of innovative solutions are provided for extended capabilities, so far unfamiliar to a cargo aircraft of its size.The Spartan is smaller if compared with the Hercules but it can provide an impressonable maneuvrability, performing tonneau and looping, such as a fighter jet, and it can achieve 3.5G forces during the maneuvers. The aircraft is pressurised and air conditioned in the cockpit and cargo compartment. The cargo compartment is 11,43 m in length, 2.24m width and 2.6m height. It can transport 70% of the equipment of an airborne division compared with the 80% of the Hercules and it can also accomodate heavy vehicles and helicopters loaded without prior dismantling and even can carry the engine of fighter jets such as F 16 or Mirage 2000 or EF 2000 Typhoon. The Spartan is constructed with a floor strength equal to that one of the Hercules, and the large cargo cabin cross-section is able to accommodate Hercules pallets. Without modification, HMMWV (high-mobility medium wheeled vehicle), AML-90, Perentie 6×6 armoured vehicle, M113 armoured personnel carrier or similar military vehicles can be driven on and off the Spartan via a hydraulically operated rear-loading ramp. 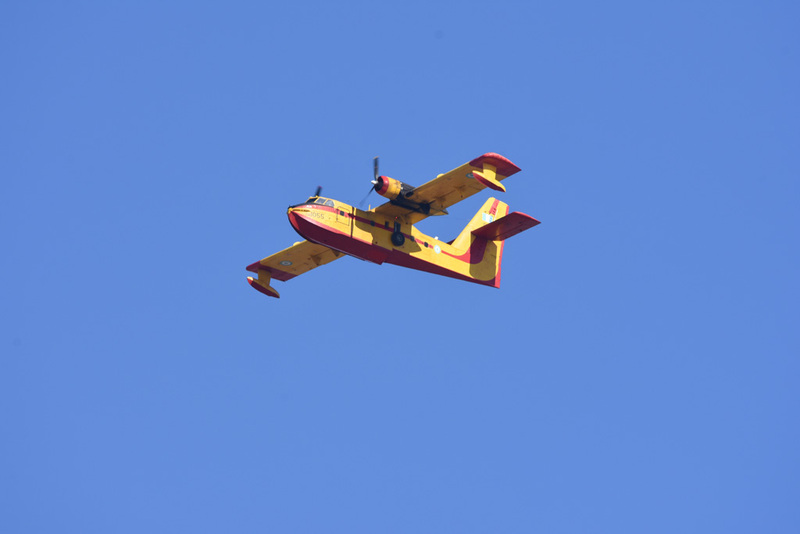 The aircraft is constructed to offload vehicles quickly while taking fire. An upward-opening door is installed in the underside rear fuselage, which is used for air drops of pallets or CDS (container delivery systems) units. The air-drop speed is typically in the range 110kt to 140kt. Moreover the landing gear is designed so that the fuselage can pitch in relation to the ground, making the loading and off-loading much easier, safer and faster. In total the C 27J can carry loads up to 11.500 kg, while it is able to perform airdrops by opening the ramp door in flight. In the latter configuration it is able to airdrop loads from 6 to 9 tons depending on the platforms carried in the cargo. Special rails are installed on the floor to facilitate load rolling. By installing seats the Spartan can transport up to 46 lightly equipped troops or 34 fully combat equipped paratroopers. In MEDEVAC configuration, 36 stretches plus the necessary medical equipment can be accomodated in the cargo compartment, with provisions for electrical power oxygen and anything needed to operate medical devices. 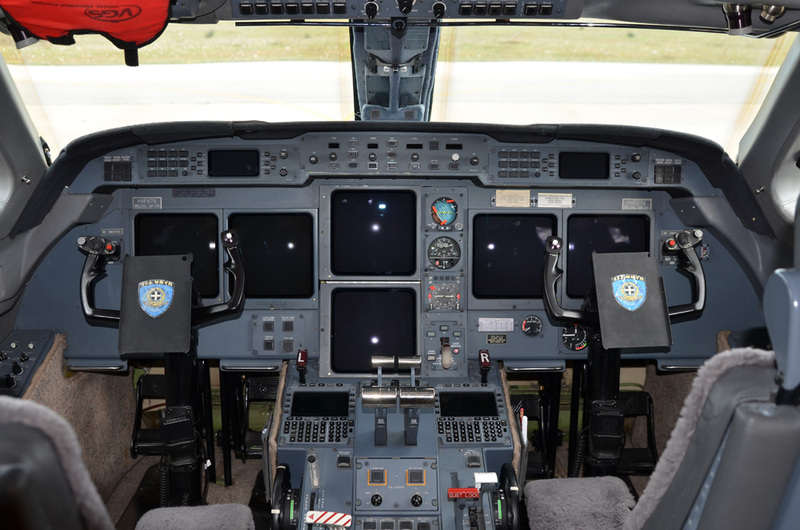 The C 27J cockpit is considered a “glass cockpit” and forms part of the state of-the-art systems currently used by HAF in the inventory of non-fighter aircraft. It features electronic instruments and an advanced flight management system, which permits the crew to input, modify and manage all flight data either on ground or in mid-air through two computer display units. All displays, except no 1 and 5, are interchangeable. The auto pilot and flight director controls are above the front panel. All data for flight control, navigation, radar, engines as well as warning, caution and advisory messages are displayed on five liquid crystal displays (CMDU’s). On the cockpit’s center console there are five panels for navigation and comunication data input (ICDU, CNPR, SAMU). All systems are compatible for use with Night Vision Goggles. The cockpit is surrounded by 16 windshields, which provide excellent visibility during all flight phases. The flight deck is very similar to that one of the C-130J Hercules. The cockpit includes digital maps, Head Up Display (HUD). The new engines permits a flight at 30.000 ft, maximum speed 325 kts TAS, much higher than the effective range of anti-aircraft artillery and portable missiles, and a rapid descent. The reinforced landing gear also permits the operation from and to semi-prepared runways. The Spartan can land in just 350 meters and it can take off in just 600 meters from an unprepared runway.Its range with full payload is 1040 km while it can reach 4360 km with half of maximum payload. During 2005 the HAF received 4 C 27J and the others eight aircraft arrived within 2006. The partecipations of HAI in the production of aircraft parts is of course a big help for the economical situation of the Country. Today the modern concept of military opertions presents a more intense necessity of medium transportation aircraft. Tactial missions are in parallel with a broad public welfare activities as search and rescue missions, humanitarian aid, medical emergencies assistance, to name some. The 354 Sqn with its C 27J fleet is destined to fulfill thise increasing requirements. 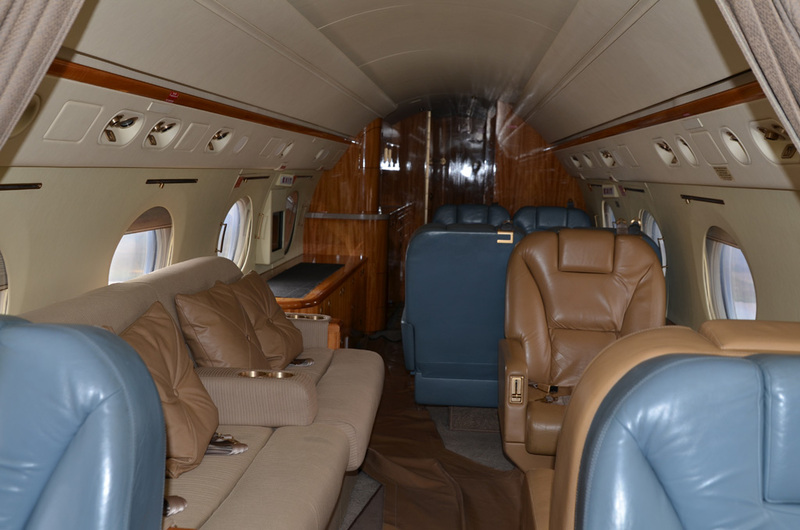 The Vip Squadron is equipped with executive jets, the Gulfstream V and Embraer legacy. It provides a fast and safety transportation for the President of Hellenic Republic, politicians, high rank officiers, for istitutional events, meeting, or NATO summit. All the pilots arrive directely from the flight school or they come from fighter jets lanes. The cabin and VIP area are very comfortable. Such as 354 and 356 Mira, even the jets of 352 Mira are available and often used for humanitarian missions, MEDEVAC, as it not rarely happens from all the several Greek islands, where the need of fast medical care requires the intervention of the 352 jets.